The hotel is right in the middle of historical district. The room is spacious with 2 floors! Kitchen and living room with sofa bed on one floor and bedroom w bathroom on the higher floor. There are several Asian restaurants (Chinese, Japanese and Thai) within 2-3 minute walking. Big supermarket is also within 2 minute walk! 1 minute walk to a historical park with a fort high enough to see the whole city panoramic view along with the view of the Andes mountain. Will definitely stay here again next time we visit Santiago! This is neither a hotel nor a Air BnB like. It is like a youth hostel. Not recommended for any one other than young college kids / travellers. On my third visit here I was disappointed in a few details. I was in room 213. The lamps near the bed did not work. I was out of my room from 10AM til 3PM and my room was not cleaned. When I came in to rest for an hour or two I called and asked if it could be cleaned when I left and was told no. Mmmm? And no breakfast was placed in my room, so the next morning I had to call not once but a second time requesting coffee supplies. Wasn't impressed. Location is walkable to many of the museums and sites. One block from Santa Lucia park - a very nice park to explore the different levels with views of the city. We got a room facing the street. It was very very noisy from street cleaning truck, garbage trucks until midnight or even past midnight? Sounded more like construction activities than normal traffic noise. And dogs barking loudly in the middle of the night. Not a restful stay. Location makes up for the loud noise. Just ask for a room not facing the street. Good internet and kitchen facility. No daily room service, but that didn't matter as we didn't require such. Hotel shuttle to airport is 24000pesos for two people. We later found out that a cab is only 15000pesos. The Hotel was great for our short stay at Santiago. Our experience was excellent due to kind and respectful hotel personnel. During our Check-In process and stay we need to say thanks to Marcelo do to him commitment and service to us. I chose a loft with a spectacular view, everything was perfect, clean. Near restaurant, supermarket, shop, café, church, park, Santa Lucia Hill, etc. I highly recommend.. When we arrived and also during our stay the interaction that we had with staff, was both friendly and helpful. The room we had was very nice - two levels. The kitchen was nicely equipped. We were able to prepare a lot of meals using the kitchen saving us money. The unit's layout was beautifully done. Modern decor. We were also very close to many features of the city - whether in walking distance such as Santa Lucia or the Presidential residence and museums associated with the residence and many more places. The subway was also close by and very easy to use. As for food we had a supermarket located beside the building so it was easy to get the things that we wanted when we stayed in at night for dinner. I would highly recommend the hotel. Park Plaza Hotel. This small hotel is a good value and has a great location in the business district. Not a lot of frills but inexpensive, clean and safe. I would definitely stay here again. The hotel felt much more like an apartment, it was a loft with a great view looking over the mountains. I had such a nice stay I extended it for another 2 nights. It is very centrally located, right across from the Cerro Santa Lucia. The Staff was very helpful and friendly. The room was very clean and the kitchen well stocked with all the amenities needed to cook if so desired. I would definitely recommend this place. The hotel was ideally located, with all the needed amenities. Excellent view. Good for a short stay. But the stuff need to improve the attitude. Also the bed is too soft to sleep. My wife and I spent two days at this apartment hotel while touring the area. Everything, but the breakfast was as expected, not luxurious, but adequate. The breakfast was put in the refrigerator overnight to be taken in the morning. There was juice, yogurt, canned peaches, milk and sandwiches. The only coffee was a packet of instant with a hot water boiler. Thee was a coffee maker for brewed coffee in the room, but no packets of coffee for it were provided. It was at a good location and clean. The room was not very big but the staff was great. Great location near Cerro Santa Lucia and the metro. About 15 minute walk from the center of Santiago. Some staff members were friendly some not. The room was clean and fairly spacious. Great location, clean, quiet, helpful staff, and comfortable. You get a great deal for the price. The loft apartment was everything that a five star hotel would be like. It was clean and classy. If only the air conditioner could have been better positioned on the bedroom upstairs instead of mid level so that the whole apartment could be cooled simultaneously. Located in Santiago Center, Park Plaza Apart Hotel is adjacent to Santa Lucia Hill and within a 10-minute walk of other popular attractions like Municipal Theatre of Santiago. This 41-room, 3-star apartment building has in-room conveniences like kitchenettes, iPod docks, and refrigerators. Each apartment is air-conditioned and features a kitchenette and space to spread out with a separate bedroom. Guests can expect to find 32-inch an LCD TV with cable channels. Other standard amenities include an iPod dock, a minibar, and an espresso maker. 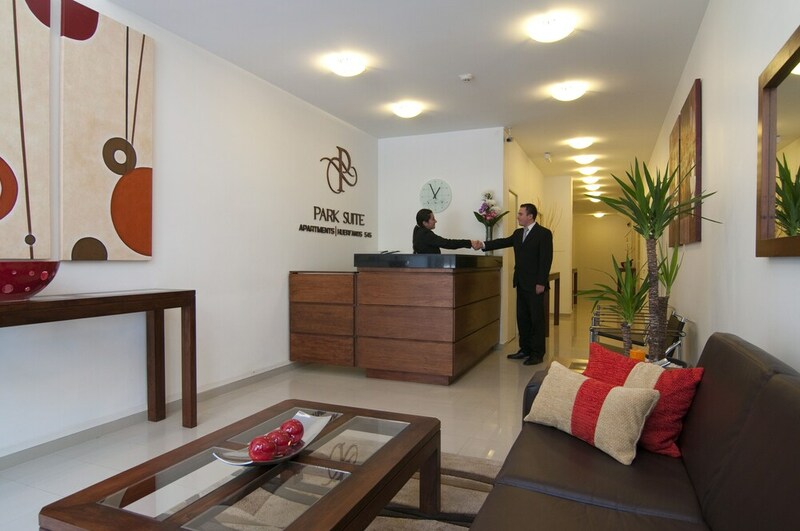 Guests of Park Plaza Apart Hotel enjoy features like a health club, free WiFi in public areas, and laundry facilities. There's free parking, and an airport shuttle (available 24 hours) for CLP 50000 per vehicle roundtrip. The front desk has multilingual staff standing by 24 hours a day to assist with luggage storage and securing valuables. This smoke-free apartment building also has a porter/bellhop. Recreation features at Park Plaza Apart Hotel include a health club. The preferred airport is Santiago (SCL-Arturo Merino Benitez): 22-min drive, 11.3 mi/18.2 km.